For many women, hot flashes after menopause are a significant problem. Sometimes, these hot flashes remain, even after the menopausal transition has passed. Although hormone levels usually balance out after menopause, estrogen levels are still low, which means hot flashes can last well into the postmenopause years. What Are Hot Flashes After Menopause? Hot flashes start as feelings of intense heat in the upper body and can be accompanied by increased heart rate, and sometimes profuse sweating and chills. Hot flashes typically last between 30 seconds and five minutes. The intensity and frequency of hot flashes after menopause varies for every woman, but the symptoms usually lessen as a woman ages. Hot flashes can also happen at night. These are called night sweats and often disrupt a woman's sleep, causing her to feel tired, irritable, and unable to function throughout the day. Some women can have hot flashes after menopause has passed, in their 60s and even into their 70s. Hot flashes can become a real burden if they're not managed correctly. What Causes Hot Flashes After Menopause? The exact cause of hot flashes after menopause is uncertain, but it's widely accepted that the fluctuating levels of hormones interfere with the function of the hypothalamus, the area of the brain that regulates body temperature. 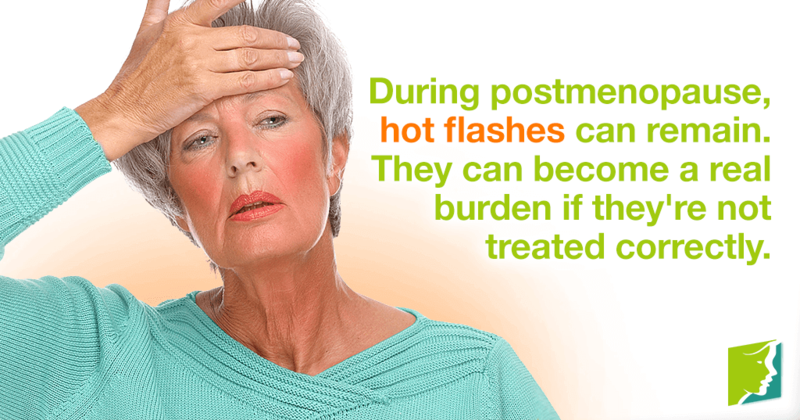 A hot flash occurs when the hypothalamus falsely detects an increase in body temperature. To help cool the body down, compounds are released to increase the heart rate and dilate the blood vessels near the skin. Stress is another common trigger of hot flashes after menopause. Minimizing stress levels can greatly reduce the severity of your hot flashes. Eating healthy. Eat regularly, in good sized portions, with a lot of vegetables. Don't completely avoid oils or fats, as some of these can be healthy - particularly unsaturated fats. This is about making sure you have a balanced diet with all the nutrients you need to keep your body and hormone levels stable. Wearing natural fibers, cotton pajamas, rather than those made of synthetic materials, can help prevent night sweats. Exercising regularly. This also helps your body maintain its equilibrium. Keeping your bedroom cool. Put a fan on to aid air circulation at night. Using alternative medicines. Herbal supplements or vitamin pills can help keep hot flashes away. Read further for a list of treatments for hot flashes. Is There a Cure for Hot Flashes? How Do Hot Flashes Affect a Woman's Life? Hot flashes are not just bursts that come and go - they have a lasting effect before and after as well. Find out what women encounter each step of the way. Why Do I Have Hot Flashes After I Eat? Hot flashes may be caused by consuming certain types of food. Read on to learn about foods that can trigger a hot flash episode.